The LOTE Auslan Activity Book A e-book is a 244 page PDF and has over 200 pages full of activity sheets ready for teachers to photocopy and distribute to students after they have learnt the signs in The Auslan Picture Dictionary e-book. The contents, pictures and signs in in The LOTE Auslan Activity Book A e-book are taken from The Auslan Picture Dictionary e-book, making it easier for the teacher to locate the topics between the two e-books. The activity sheets are suitable for students in Prep, Grade 1 and 2. There may be some students who are ahead in Auslan and may find this too easy. For these students, teachers can use activity sheets from LOTE Auslan Activity Book B – Intermediate. Mix and Match, Cut and Paste, Tracing, Labelling, Wordsearch (with clues), Colour In, and Translating. 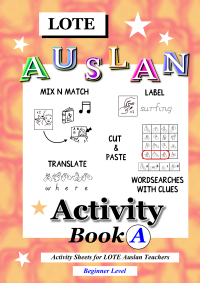 Click HERE to see what The LOTE Auslan Activity Book A e-book looks like (youtube video). The LOTE Auslan Activity Book A e-book is copyright and for personal and school classroom use only. The e-book is to be printed only once its entirety per individual/teacher and the individual/teacher may photocopy the e-book as many times for personal and classroom use. Please do not photocopy or reprint the e-book to be distributed to other individuals or teachers, please direct them to this website instead.